Check out how one of the victims in the attack was able to subdue the bull. Amazing story. Our thoughts are with the two who were injured. A 22-year-old South Kitsap woman is in critical condition at Tacoma General Hospital after a bull attacked her and a volunteer with the Kitsap County Sheriff’s Citizens on Patrol Wednesday morning. The attack took place in her in-law’s pasture on property in the 6500 block of East Hilldale Road. The volunteer, a 64-year-old man, was there with another COPS volunteer, a 75-year-old man, to check the vehicle identification number of a car in the field. VIN checks are required before a vehicle being scraped. According to a Kitsap County Sheriff deputy’s report, the woman accompanied the volunteers into the field, which was occupied by the bull and three cows. There were several other vehicles in the pasture. As the two men were checking the vehicle, the bull became agitated and pinned the woman to the ground, against another vehicle. The 64-year-old man was able to district the bull, estimated to weigh between 1,000 and 2,000 pounds, long enough for the 75-year-old to help the woman to her feet and out of the pasture. As the two were making their escape, the 64-year-old slipped in the mud, and the bull started to gore him. The victim managed to get back on his feet, only to have the bull knock him down and attack him again. The man kept trying to get up and escape, but the bull kept up the attack. The victim eventually grabbed the bull by the nose and squeezed, forcing the animal to retreat. At that point, the victim was able to escape from the pasture. Sheriff’s deputies responded to the incident and gave first aid to the victim, who had lacerations and puncture wounds, and to the woman, who had unspecified injuries. South Kitsap Fire and Rescue medics transported the man to Harrison Medical Center’s emergency room. He was discharged at 2:40 p.m. The woman was admitted to Tacoma General Hospital’s emergency room and later admitted. Her condition is critical, according to a hospital spokeswoman. The bull was not harmed and was not taken from the pasture by Kitsap County Animal Control, the report states. 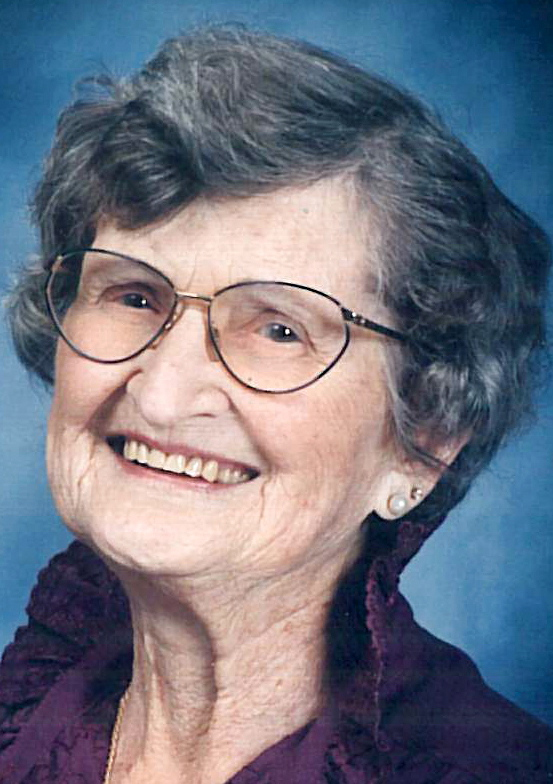 If you read Saturday’s obituary page, you may have seen the notice that Laurine Strachan died Sept. 22 at Harrison Medical Center. If you looked at Laurine’s photo, you might think she was in her eighties or even late 70s. Unless you did the math, you may not have realized she was 102 when she died. 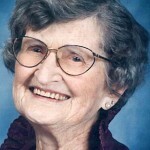 Laurine, born April 20, 1907, was one of the centenarians I interviewed for a story people who pass the century mark. She had been healthy and remarkable active for her age up until about two months ago, according to her daughter Margaret Dues. She had developed a digestive system disorder, and he legs were failing. She had moved to an assisted living center, at her own request. “You know her. You couldn’t tell my mother anything,” said Dues. But she had been ready to move back to her independent living apartment at Canturbury Manor, when she took a turn for the worse. “I think she sort of gave up at that point she really had a sharp mind all the way,” said Dues. As I was interviewing Laurine, and the others in the article I felt I was getting a glimpse into a stage of life most of us won’t get to see. Beyond old, the really elderly share many traits in common, including a Zen-like acceptance of life … and death. It was a privilege to meet them, and I know Laurine will be missed. At Laurine’s request there will be no services. As her daughter said, she had plenty of birthday parties to make up for it. Chambers from both counties will hold a “summit” on how to better coordinate their efforts. The North Mason Chamber of Commerce won’t be adding “Kitsap” to its letterhead. The proposal to change the name to Mason-Kitsap Chamber of Commerce was initiated by the chamber’s executive board. It failed to get the required two-thirds approval at a members’ meeting Wednesday at the Theler Community Center. Thirty members voted for the measure to reference their neighboring county in the chamber’s name as part of a comprehensive bylaw update; thirty-nine voted against it. Total membership is 406. Members had the option to vote by proxy. The intent of the name change, according to chamber president Mike Boyle, was to reflect the regional focus of the chamber. The name change also was a nod to the growing number of chamber members who hail from Kitsap, Boyle said. North Mason’s membership has nearly doubled in the last 18 months, and many new members work or live in Kitsap County. But the proposal became a divisive issue generating heated discourse in North Mason and beyond. Three of four Kitsap chambers of commerce weighed in with a letter to the North Mason chamber shortly before the vote. According to Mike Strube, president of the Port Orchard Chamber of Commerce, the letter politely chastised North Mason for leaving its neighbors out of the loop. “We would have liked to have had a little discussion before they took it to their membership,” Strube said. Instead, the proposal was publicized after the North Mason Chamber’s board had already included the name change in an a draft update of the by-laws. Division was evident among the chamber members who voted Wednesday. “My first thought was it seemed a little presumptuous to assume Kitsap would be an appropriate name to include in North Mason. … It just didn’t feel right,” said member Linda Blackwell, former chamber secretary who retired in 2006 from the Port of Bremerton. Blackwell voted against the name change in part because it appeared to discount smaller North Mason communities around Hood Canal. Boyle said friction over the name change has had a positive outcome. The four chambers have since agreed to hold a “summit” with an in depth discussion of how they can better help each other promote the Kitsap-Mason region. “If anything comes out of this whole name change, it makes me excited for the opportunity to work together with the local chambers to regionalize ourselves and leverage ourselves,” Boyle said. The by-laws will now go back to committee to be reworked and presented to the membership again, probably in November. It’s likely the name change proposal will be dropped, Kenney said. Hoffman, who chairs the membership committee on the chamber’s board, was disappointed that fewer than 17 percent of members turned out to vote on the hot button issue. She would favor mail-in voting in the future to accommodate those who are unable to make the meetings and to get better representation on all issues. 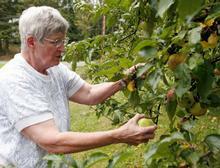 Olalla resident Doris Worland has gotten some help with her fruit gleaning project in South Kitsap. Earlier this summer, Worland mounted a one-woman gleaning campaign, trying to play matchmaker between property owners with more fruit than they were able to use and local food banks. She was discouraged by a lack of response to fliers she put in food banks and other locations. But after her story ran Saturday in the Kitsap Sun, a church group from Central Kitsap joined Worland on Sunday and picked more than 150 pounds of apples and pears from trees at two locations. The group donated one box of fruit to North Kitsap Fishline and the rest to Central Kitsap Food Bank. Marietta Nelson, who is the Kitsap Sun’s education reporter, was leader of the group. She said some of the kids were a little intimidated by some cows in the orchard. Nelson, an Iowa native, appointed a couple kids as cow chasers and reassured the others that the cows wouldn’t hurt them. Doris received an e-mail and several other calls from people who wanted to help. “I really appreciate it,” she said. If you have fruit available for picking or if you want to help with the gleaning effort, call Doris at (253) 851-4303 or (253) 970-2047 or e-mail dorisforfoodbank@aol.com. I noticed today Chris Dunagan’s “Watching Our Waterways” blog a post on fishing jokes. It piqued my interest, since I recently got to go salmon fishing with my husband for the first time since B.C. (before children). The fishing was good, and with two of us licensed, we were able to bring home more than he usually does. “You only love me for my punch card,” I told him. On October 7, we were trolling the Strait of Juan de Fuca off Sekiu. I was reeling in my line, and I saw that something was after it. I thought it was a salmon, but then I saw a wide flap-like appendage break the water. It was brown in color, not at all like a salmon. A minute later something hit my husband’s line hard and dove with it. Believing it to be a large salmon, Mike got excited and had fun playing it. It moved and acted enough like a salmon that he was convinced that’s what he had. But when he got it close to the boat, he couldn’t believe what he saw – a three-foot squid. Netting it was a trick. Getting it out of the net was even trickier. Unhooking it was just plain scary. Those things have a beak that could do some major damage to a finger or hand. Although Mike has fished this area for more than 20 years, catching a squid was first for him. We looked up the regulations and determined that were were allowed to keep it. The creature was amazing. Its skin changed color rapidly in moving patterns, ranging from iridescent white to rusty brown. Every now and then it would hug itself with its flippers (probably the wrong term) and turn itself into a rigid torpedo shape. Its eyes conveyed the impression that it had a level of intelligence, like a whale. When we got in to shore, we found a number of other people had also caught squid. Ours turned out to be 10 pounds. The largest caught that day was an estimated 20 pounds, although it was let go. 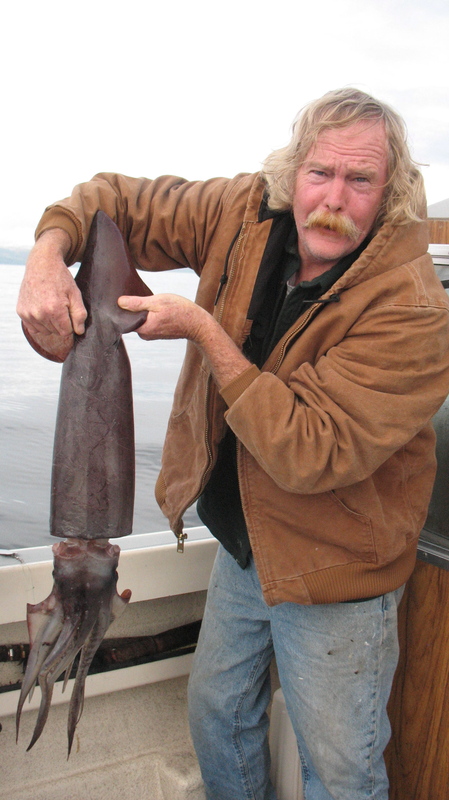 Turns out they were Humboldt squid, which typically hang out in California and South America. They can get up to six feet long and 70 pounds. What they were doing up this far north, no one could guess. Chris Mohr, owner of Van Riper’s Resort in Sekiu, said he’d never seen anything like it. Theories include fluctuations in ocean temperature, Ph levels (relative acidity) and food sources, but none so far has been proven. On the docks of Van Ripers’ some people knew just how to filet and skin the squid. One couple said they had caught one the day before, and they had cubed and sauteed the flesh in garlic butter. The consistency was rather like scallops although a little chewier, they said. They had even kept the ink, which they heard could be used to flavor pasta. They had kept to beak, which was an intimidating appendage, larger and harder than a parrot’s beak. This week, as reported in the Peninsula Daily News, the squid began beaching themselves on the shores of Clallam Bay, again for unknown reasons. I’m hoping my fellow reporter Chris Dunagan can pick up where I left off and offer some explanations for the strange phenomenon. If our Web editor Angela Dice were here, she would no doubt find it fodder for her food blog, The Food Life. If anyone out there can offer recipes for squid, I’d be most interested, although I suspect that was our once-in-a-lifetime encounter with the species.